Four little forest animals invite kids to play and learn in the magical forest! Your new pocket friends - Squirrel, Mole, Mouse and Hedgehog - will teach you how to make a yummy cake, do forest art and craft works, collect forest gifts like berries and nuts, and grow your own forest goodies! Don’t get tricked by the looks of these forest animals. They love to get messy while playing and working but they always tidy up, even after taking a bath! 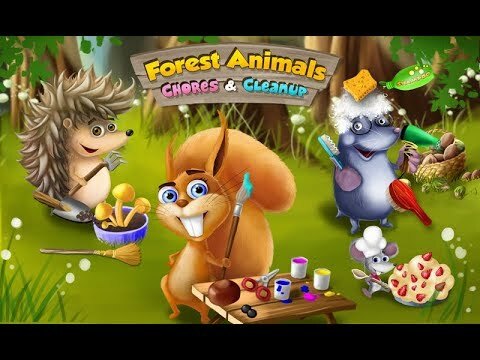 Together with forest animals, you will learn how to clean up fast and keep your things neat! Cute little mouse and hedgehog will show you how to bake a super delicious cake with wild strawberries. Don’t eat too much because you’ll have to clean up too! Wash the dishes and keep the kitchen tidy after cooking! Little hedgehog likes to grow his own forest goodies in his mini garden. He will teach you how to plant, grow and take care of the most delightful forest mushrooms! Crafty squirrel is here to teach you forest arts and crafts. Make a toy from things you can find in the forest and don’t forget to clean up your workspace! Clean the table, throw away garbage and put art tools in their places after fun time of creation! Uh-oh, squirrel’s fur got covered in paint after arts and crafts time. Help her look neat and cute again. Wash Squirrel’s fur, dry it, play dress up and create a nice new outfit for her! Help the little hedgehog pick hazelnuts and blueberries. Remove tree leaves and icky slugs form these forest goodies. Wash berries and nuts carefully so that forest animals would have some nice snacks! Mr. Mole was digging all day and got dirty. Help him relax after a long day of work: give the little Mole a warm bubble bath, dry and brush his fur, clean his teeth and take care of the nails. Clean up the bathroom when Mole’s bath time is over! Get rewarded for helping forest animals do their chores. Play more, reach new levels and collect all forest trophies! Visit the old forest clock and spin it. You can win up to 500 extra coins if it’s your lucky time! Turn on an old TV and watch kids movies with your little forest friends. Play video and get 200 coins!